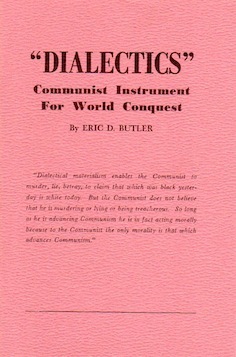 Dialectical materialism enables the Communist to murder, lie, betray, to claim that which was black yesterday is white today. But the Communist does not believe that he is murdering or lying or being treacherous. So long as he is advancing Communism* he is in fact acting morally because to the communist the only morality is that which advances Communism. From the time of Marx and Engels, there have been differences of opinion amongst the Marxist-Leninists concerning tactics. But the controversies concerning tactics have merely assisted the Marxist-Leninists to improve their methods for advancing a fixed unalterable strategy. As the Communist Empire expands, it is certain that internal tensions and frictions will increase. Friction and tensions in the Communist bloc would, of course, help the West if the West made up its mind that there can be no compromise with Communism.